I use the safe and secure Paypal payment system to allow you to pay your deposit and fees using your credit card (MC, Visa, Amex, Discover). Contact me for more information. Looking for some quieter music for the more introspective interludes in your event? 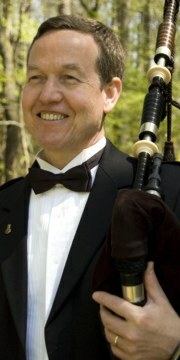 Tom can provide guitar, mandolin, whistles, or smallpipes in addition to the Highland pipes. Add more variety to your event, without adding another layer of detail and another person to manage. Find out more . . . If you need a bagpiper in the Metro Atlanta area, or anywhere in North Georgia, you’re in luck! Tom Crawford is available to perform at events throughout Georgia and the southeast US. Something about the primitive sound of the bagpipes reaches deep into our souls, whether we are Scottish or not. Played well, bagpipes can magnify and enhance our emotions, making life’s special moments even more memorable. It’s quite remarkable that the same instrument that brings us such joy at a wedding can tug on our heart strings and help the mourning process at a funeral. The instrument seems to give voice to emotions that words cannot reach. When Tom Crawford performs at your event, you can rest assured that he will be there on time, ready to go, and dressed in appropriate highland attire. Available in Bartow, Cherokee, Cobb, Coweta, DeKalb, Douglas, Fayette, Floyd, Forsyth, Fulton, Gwinnett, Hall, Henry, Paulding, and all of North Georgia. Contact me for more info . . .
Site contents copyright ©2006-2018, Metro Atlanta Bagpiper / Occasional Music. All rights reserved. This Website designed and hosted by Atlanta Web Service LLC. For questions or comments, please contact the Webmaster.